SMU Film & Media Arts Dept. 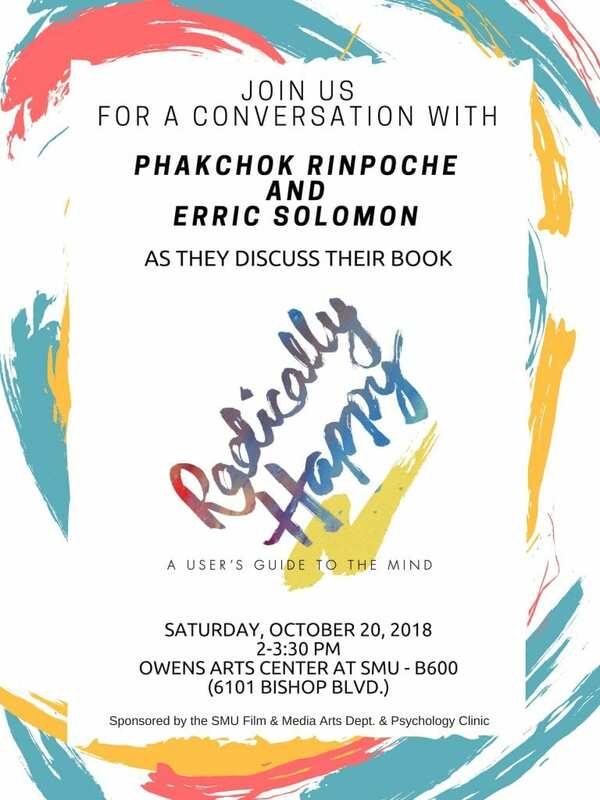 and the SMU Psychology Clinic invites you to join authors Phakchok Rinpoche and Erric Solomon for a conversation on their upcoming book Radically Happy. Phakchok Rinpoche is a premier example of a new generation of Tibetan Buddhist masters. He combines the most profound aspects of traditional wisdom teaching with his pithy, humorous observation of their ongoing relevance to the incredible fast pace of modern urban life. Erric Solomon, throughout his career as a Silicon Valley technology entrepreneur and now as an author and innovative meditation teacher, has been interested in understanding the mind and how it functions, both as a user-experience designer and as a mind hacker. Together these two meditation experts, meet to present a path to happiness through accessible meditation and mindfulness techniques in Radically Happy.